Rocky Mountain Whitefish (or simply Mountain Whitefish) (Prosopium williamsoni) are some of North America's most widely distributed salmonid fish. They range from Canada's Northwest Territories south through British Columbia and most of the Western United States. They are closely related to trout, salmon, and grayling. They do however look to some anglers like chubs, and suckers, which are members of the minnow family. This angler ignorance gives whitefish a bad rap since minnows have lots of forked bones, and some kinds of minnows taste bad. Whitefish can be easily identified because the have an adipose fin and minnows don't. The all tackle record for Mountain Whitefish is 5-pound, 8-ounces from the Elbow River, Calgary, Canada. 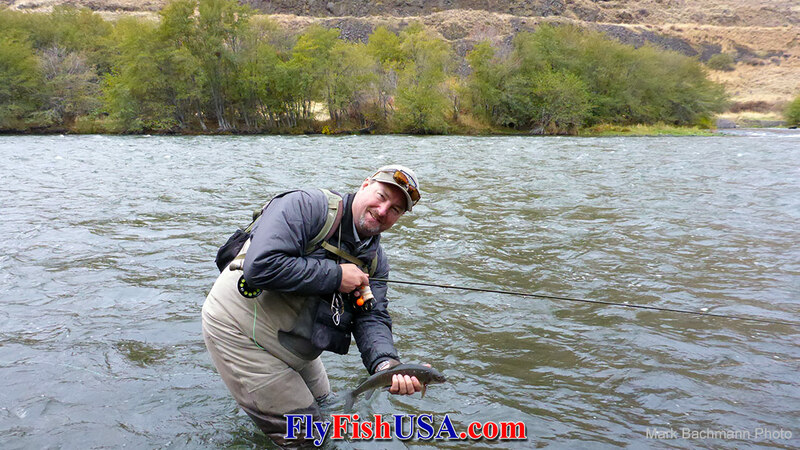 The author has seen one whitefish that was probably larger caught from the Deschutes River in Oregon. However, most adult whitefish range from 14" to 18" and weigh less than 3-pounds, with 20-inch whitefish being fairly rare in most watersheds. 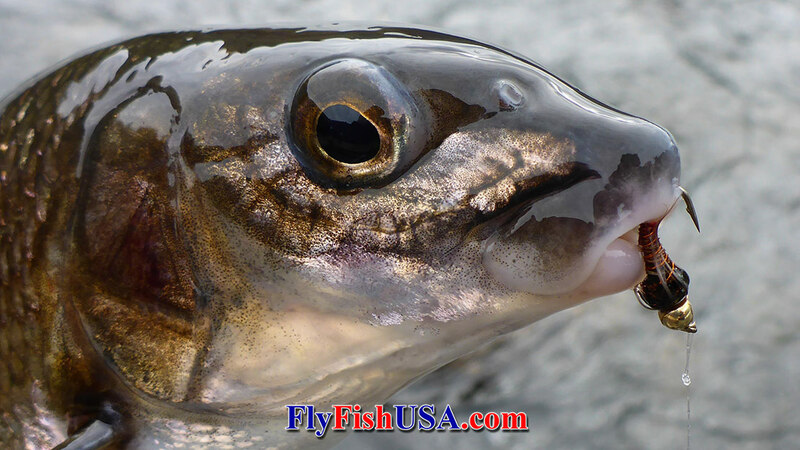 Whitefish are primarily bottom feeders that eat all kinds of aquatic invertebrates as well as fish eggs. 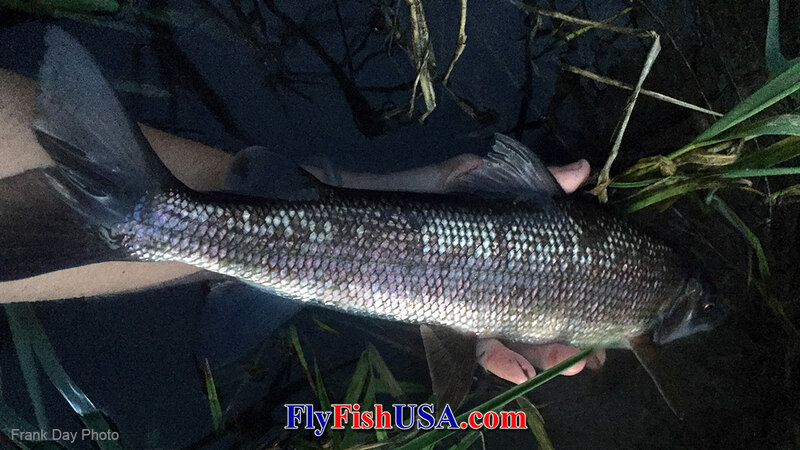 At times in some rivers whitefish will feed at the surface for extended periods and can provide som exciting dry fly fishing. Whitefish are very active during winter when water temperatures are cool. Whitefish spawning occurs November through January in most local rivers. Mountain whitefish often congregate in large schools in streams to broadcast their adhesive eggs over gravel bars in tributary streams. Since they don't dig redds like salmon and trout their spawning activity is less strenuous. They don't seem to suffer as much weight loss as trout. When fishing for whitefish, nothing beats the Euro Nymph techniques with small bead head nymphs drifted close to the bottom of your river. The picture above shows the large adipose fin that distinguishes members of the salmonid family from minnows and othe families of fish.